There’s so much to explore in the world of organic produce; from delicious food, to gardening, to evenings out. As more and more people discover the delights of everything organic, London is fast becoming an organic hot-spot. We’ve put together a list of places where you can enjoy snacks, drinks and events that are eco-friendly and sustainable. The Hornbeam is a vegetarian café in Walthamstow who aim to promote sustainable, low-cost living. Not only is it the perfect place for you to get your fill of delicious locally grown organic food, you can also find out about other green events going on in East London; they collaborate with other organisations, including garden OrganicLea and Waltham Forest Cycling Campaign, as well as regularly hosting music and events. This is the perfect spot to learn more about organic living. The Hornbeam café is at 458 Hoe St, Walthamstow E17 9AH. Open 10am-5pm Tues – Sun, except Thursday 11.30am to 5pm. Lottie Muir, gardener and mixologist, has transformed a rooftop in Rotherhithe into a sweet garden hideaway where you can sample a range of cocktails infused with the ingredients grown in the very garden you are sitting in. Nestled above the Brunel museum, this adorable bar is a great place for a date or relaxed drink with friends, where you can try drinks made with fresh herbs and flowers. Midnight Apothecary can be found above the Brunel Museum Railway Avenue Rotherhithe SE16 4L. Open every Saturday from 7th October to 16 December. Buy £5 tickets in advance. Flavour Garden take a simple approach to food by using sustainably and ethically sourced ingredients to make reasonably priced, delicious and healthy food. They serve a range of nourishing breakfast options such as porridge, acai bowls, or breakfast pots, as well as lunch and dinner options such as salads, salmon and tartlets. Not only is their food organic, but all their drinks are too, from their Lincoln & York coffee to their range of organic wine, beers and cider. Flavour Garden is at 4-6 New London Street EC3R 7NA. Open Monday - Friday 7am - 10pm. Saturday/Sunday: closed / available for private hire. Growing Communities is a social enterprise based in Hackney, led by a group of people who are passionate about building a better, fairer food system that focuses on sustainability and community. Their Saturday market is the UK’s only 100% organic market, with all their farmers using organic or biodynamic methods of growing. They have a wide range of produce from eggs and cheese, vegetables sourced from nearby Kent and Essex, and handmade breads and cakes. 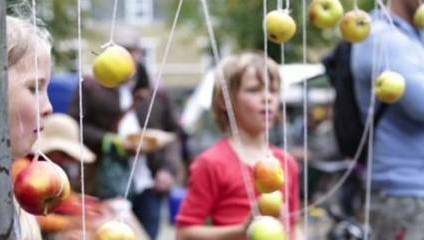 Growing Communities Farmers Market is every Saturday 10am to 2.30pm St Paul's Church Stoke Newington N16 7UY. If you want to get involved in some gardening then Loughborough Farm might be a good place to learn about planting, harvesting and working with crops. It was launched in Loughborough Junction in August 2013 and is part of a community food growing project in the local area. You can volunteer in the garden itself, or organise events and craft evenings. Every first Saturday of the month, they sell their vegetables, as well as handmade soaps, hand creams and honey from nearby Herne Hill. Loughborough Farm is open Tuesdays from 1-3pm and Saturdays from 1-3pm. Email loughboroughfarm@gmail.com for more information.